Se 8 af de tabte fly: Google Map 9APR1944. monument blev afsløret her den 5. maj 1946. Se Informationstavle. inden da var de fleste besætningsmedlemmer sprunget ud med faldskærm. Flere sprang dog i for lav højde og fik derfor alvorlige kvæstelser. blev muligvis dræbt under angrebet, eller da flyet umiddelbart efter nødlandingen brød i brand." monument was unveiled here on 5 May 1946. See Information table. "At the overflight the formation was attacked by German fighters south of Fyn. 42-52569 was hit, and the pilot attempted a forced landing. The leader of the formation saw the plane carry out a perfect forced landing, but most of the crew members had bailed out before that. Several of them bailed out at a low altitude and that caused severe injuries. 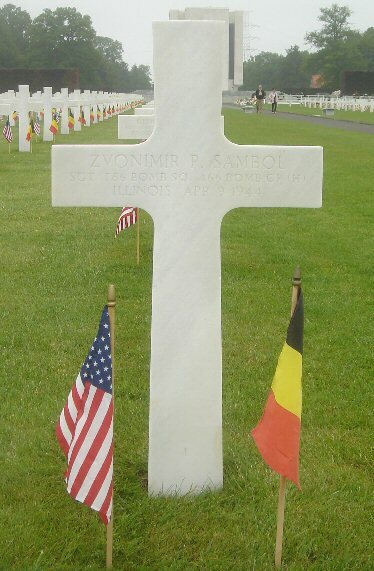 Ardennes American Cemetery in BELGIUM to be transferred to the USA. (Source: FAF) He stills rests there. He entered the Service from Illinois. Buried at Plot B Row 39 Grave 1. Awards: Air Medal, Purple Heart. (Source: ABMC) See Monument to 46 American airmen.